The past twenty years have seen global economic changes that have altered many of the Mountain Resources Commission (MRC) region’s local economies. Once-prosperous communities whose economies thrived on producing goods have seen these jobs disappear, stranding a workforce and infrastructure. These changes affect the distribution of employment, establishments, sales, and earnings among industry sectors, and their net impact on the economic health of a place depends on both an area’s economic diversity and adaptability. The location quotient (LQ) is a common measure of economic structure – it shows how local activity compares to activity in a reference area. 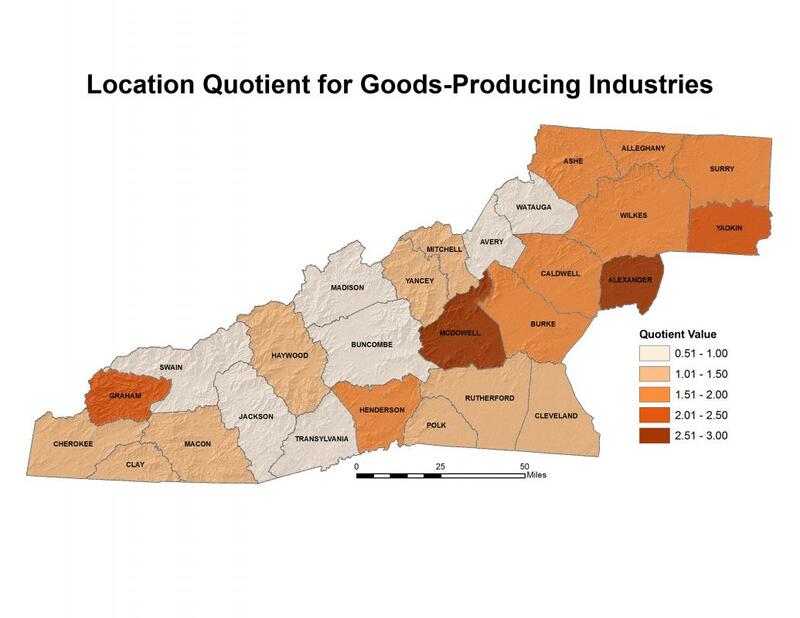 For example, the employment LQ for North Carolina in goods-producing industries is 1.15, meaning that the portion of employment in goods-producing industries within the state’s economy is 1.15 times higher than in the national economy. Compared to the nation, the portion of employment in goods-producing industries within the MRC region is 1.41 times higher. Between 1990 and 2010, the employment LQ for goods-producing industries has declined by about 20 percent for both the MRC region and the state. 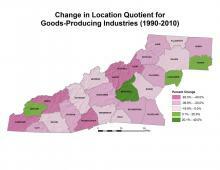 So, goods production remains a larger portion of employment in the state and regional economies than nationally, but has become substantially less so during the past twenty years. 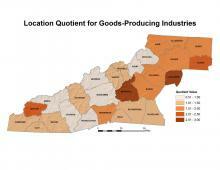 The MRC region counties with employment most concentrated in goods-producing industries (high LQ) are Alexander, McDowell, Graham, and Yadkin, with goods-producing employment LQ’s of 2.9, 2.7, 2.3, and 2.0, respectively. 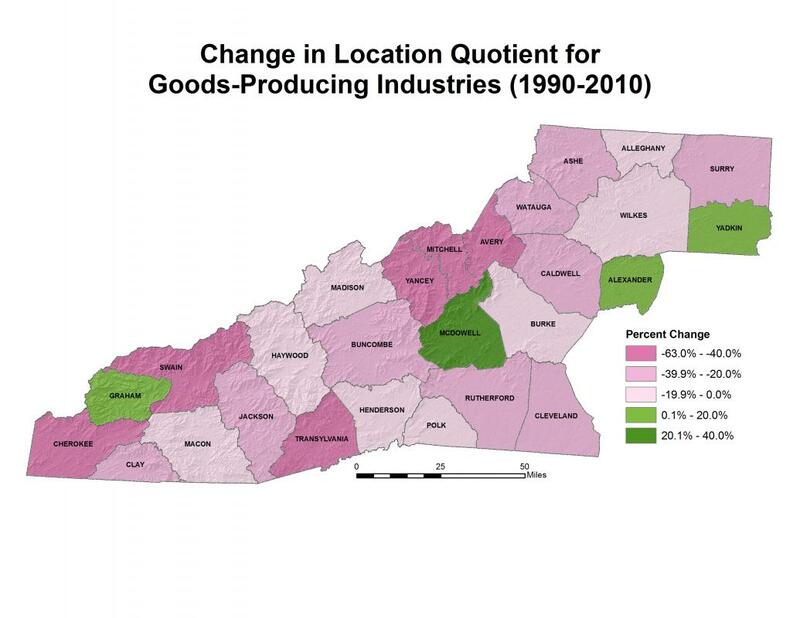 These counties also saw their concentration of employment increase relative to that of the U.S. during the past twenty years, while the remaining 23 counties in the MRC region experienced a declining concentration in goods-producing industries. The employment concentration in goods production was lower than that of the U.S. in seven of the region’s counties – typically those with lower median ages and more tourism-intensive economies. Generally, the higher the current concentration of employment in goods-producing industries, the higher the twenty-year growth rate in goods-producing industry employment concentration.